What if human services could come from what we choose, instead of what the government decides? Think of human services as something you guide through collaborative Governances that share ideas and advances at the speed of networks. When we work together vendors will learn the products and services you want. Then Governances’ continuous connections will help deliver them. From healthy food to lifelong education to medical care, Governances could help human services develop what you want. If human services could come from what we choose, instead of what we’re told we’ll get? 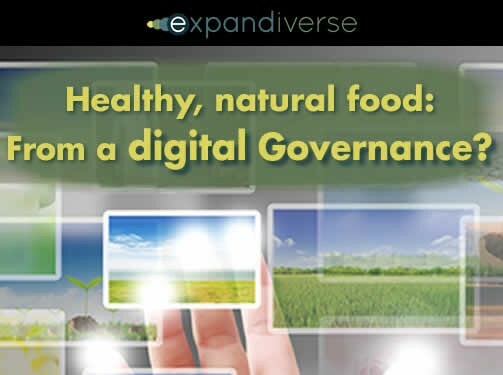 Let’s imagine a Healthy Food Governance of the future. Imagine a decade from now where America’s new “healthy food industry” leaders are meeting. On the podium and at the tables the energy and confident buzz is palpable. Over its first decade, the Healthy Food Governance — the dream of a few unconventional pioneers who had a different vision of food’s future — became one of America’s success stories, transforming the quality of eating and nourishment for tens of millions of people. They had started small, but grew by digitally connecting all parts of the food chain. The energies of everyone from farmers to agricultural scientists, from food manufacturers to supermarkets became aligned for the first time. They took their goals from the active participation of adults, parents and kids who wanted to buy and eat healthy food every day no matter where they lived. Over time they connected the parts of the food production system so it worked for everyone. Each trial, and then each success, was shared and promoted at the light-speed of tomorrow’s networks. Farmers, manufacturers, retailers, health professionals and consumers started connecting continuously with each other, figuring out how to produce healthy food on sustainable farms, how to manage the economics so it was both profitable and affordable, and how to make it taste great. The Governance knew the numbers and made sure it was honestly marketed and sold to the profitable business, enjoyment and health of all. It started working. The Governance’s food chain produced healthy food while people lost unhealthy weight, gained new energy to become self-directed, confident people who changed their lives and health. With visible success came new members as more became engaged. New farms joined, food manufacturers produced more kinds of healthy foods, retailers featured it and family kitchens and restaurants enjoyed the multiple rewards of healthy, natural food. Gradually those who were involved rose to lead a healthy food industry. On this day, some of the leaders took turns at the lectern. A Colorado farmer told how his water had been cut drastically, but he had learned to grow more and higher quality crops with half the water. Then he put digital Teleportals all over his farm so he could spend years online showing thousands of farmers how to adapt each part of their farms when their water supplies were repeatedly slashed. A California agricultural scientist talked about chicken farmers who used all the “natural water” chickens could drink to produce healthier, happier chickens with 10% less water. He had spread that know-how like a digital Johnny Appleseed to other chicken farmers, using the Food Governance’s continuous connections. A Texas food manufacturer told how they used continuous connections with customers and farmers to make their products fit high natural standards, great taste, health and affordability. He said that was such a key to success that they used the Governance’s GRS — its Governance Revenue System — to pay 5% of their total revenue to the Healthy Food Governance. The CEO of an East coast supermarket chain spoke of adding real farmer’s market aisles with fresh local produce, dairy, bakery and meat sections, plus healthy food products in other sections. He proudly explained how they joined the Governance so its continuously connected farmers, manufacturers and customers would make sure their in-store farmers markets were real, with high standards everyone trusted, appreciated and enjoyed. A mom thanked everyone for becoming a food industry that provided natural food that had it all — great taste, appeal, convenience and price. She also described the digital benefits. All her family’s screens were more enjoyable because they used the Governance’s paywall settings to shut out advertising from the traditional food industry. Now, the only food and restaurant ads that reached their screens were from healthy food companies connected with the Food Governance. It’s more than the food we buy, she said, it’s the way we live, a better digital world for her family. The last speaker was the Governance’s CEO. They were reaching a major milestone: half a billion dollars in revenue. The biggest source was their GRS, the Governance Revenue System, technology that automatically transfers a small percentage of the purchase price of affiliated products bought by Governance members with credit and debit cards. Their second largest revenue source was paywalls, since millions of members get paid by the Governance’s healthy food vendors for watching their ads, and the Governance shares in that revenue. 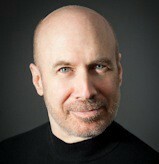 It’s a new evolution to “partnership capitalism” he called it, a win-win that was growing a collaborative economy. Everyone gets to live in a digital world they want and control. The Governance’s half a billion dollars in revenue showed how large and profitable the healthy food industry was becoming. A large path to profits had become aligning what everyone in the food chain really wanted, and showing how digital collaborations can deliver it. He announced their new slogan, “Feed the Planet,” saying this had once been only an idealistic dream but for the first time they were building an online world that benefits everyone in the real world of food — both today, and for generations to come. From new technology to establishment in one decade? It’s time to think different. 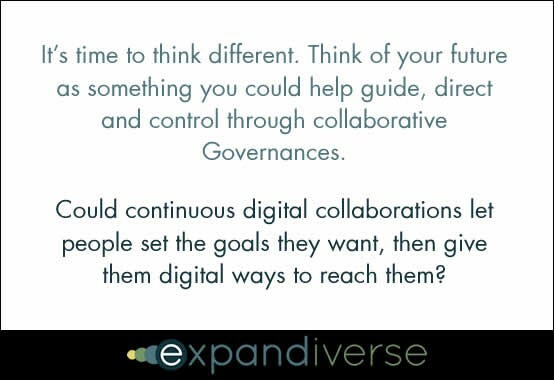 Think of the future as something you could help guide, direct and control through collaborative Governances, not something that will lock you down. In the future, could human services like healthier food be driven by what you and others want across the food chain? Could continuous digital collaboration set high standards, and let people work together through the food chain to reach them? One step could be one or more Food Governances through which people can collaborate to get the healthy food they want. A next step could include a Governance Revenue System that helps fund Governances of all kinds. Another step could be personal paywalls so we control which ads are shown or blocked from our screens, and everyone can live in a digital world that reflects our values. Healthy food could be a start. Your freedom to choose might grow to include your digital world, and the Governances you join so you help develop it, guide it, control it and receive the benefits you want. One small step at a time. From today to a digital world that can turn questions into answers without end. Will digital identities help us expand beyond life’s too-short limits, while increasing our privacy and control?